In the northwest corner of Arkansas, atop one of the picturesque Ozark Mountains, sits The Little Portion Retreat and Training Center, owned and operated by the Brothers and Sisters of Charity community. Here you will find Little Portion’s founder and benefactor, Christian singer/songwriter and monk, John Michael Talbot. John Michael was born into a musical Methodist household in Oklahoma in 1954. He began playing piano and drums when he was six years old, and later took up the banjo, dobro, and guitar. He left school at 15 and together with his brother Terry, began his musical career as a guitarist for the country folk/rock band Mason Proffit. The group produced five albums during the ’60s and early ’70s, before disbanding just as they were on the brink of stardom. Talbot became disillusioned with the rock music life. He never did drugs, and after a concert where Mason Proffit shared the stage with Janis Joplin, Talbot looked out over the arena floor, now strewn with empty wine and whiskey bottles and drug paraphernalia. "Suddenly it all seemed empty, sad." Following the breakup of the band, John Michael began a spiritual exploration that included Native American religion, Buddhism, and finally the Bible. As members of the ’70s Jesus Movement, John and his brother helped lead the way in the contemporary Christian music scene. By the end of the decade, John had written and recorded several albums, but had withdrawn from the public eye to pursue his increasing interest in St. Francis of Assisi. In 1978 he joined a secular Franciscan order in Indianapolis. He started The Little Portion, a house of prayer, and planned to live as a hermit. But having had a taste of his mellow and reflective new sound, people clamored for more, and so he started his music ministry. In 1982 he and six friends moved to the Ozark Mountains, where Talbot had bought 25 acres while on tour with Mason Proffit. They established The Little Portion Hermitage. There are currently about 37 members of his Brothers and Sisters of Christ community, plus another 500 worldwide. Like Talbot, all the members have taken vows of chastity, poverty, and obedience, and work to provide help to those in need. Talbot likes to experiment with his music by combining text, music, and instruments of past and present, thereby spanning the ages. The Dove Award winner has raised millions of dollars, along with public awareness, for Mercy Corps International, a Christian emergency relief agency that helps people worldwide. In 1988 he was awarded Mercy Corps International’s Humanitarian of the Year award. Talbot, who has also written 13 books, had been nominated for the Dove Award 10 times and won in 1982 for Album of the Year with Light Eternal. His expansive discography lists 39 titles, recorded from 1976 to the present, with the most recent project being The Pathway Series, six instrumental albums designed for quiet contemplation. What makes him so prolific? "If you have something good, you’re not afraid to share it," he says. And his fans, having bought over 4 million albums, have found something good with his soothing tenor voice and virtuosic guitar playing. John Michael Talbot's advice to Christian artists. John Michael Talbot on church growth, God's bigness and more. John Michael Talbot contemplative grace and transformation, real culture and vein relgion. John Michael Talbot's take on heaven and hell. 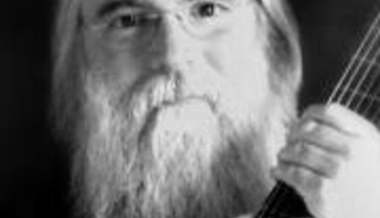 John Michael Talbot on his road from rock and roll to the Jesus Movement to Calothicism.